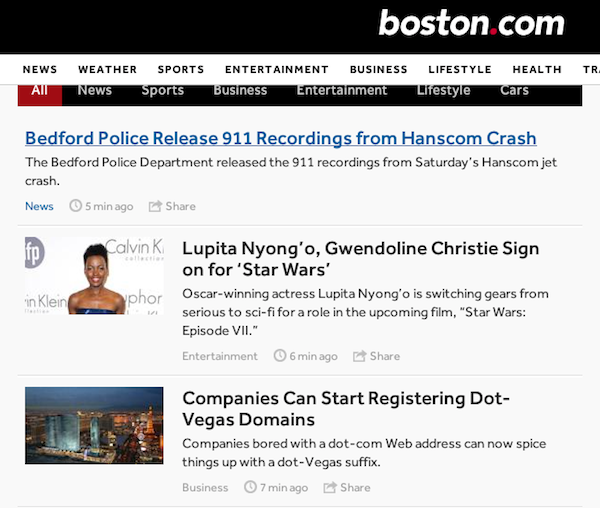 I visit Boston.com many times per day, and I was surprised to see an article about .Vegas domain names right on the Boston.com home page. As you can see, the article link has a fairly prominent spot on the home page, although that may be due to the fact that it was just published. Any time that the home page of a major newspaper mentions domain names, it’s a good thing for this business. Isn’t that just a paid press release that is fed to all the major news outlets? The AP would indicate that it is an Associated Press article rather than a press release written by the company.